A different runner? At one level, I certainly was. Since the Dexter-Ann Arbor half last June (time: 1:42), I’d completed a full marathon, set new personal records (PR) in the 5K and 5 mile distances, and won my first age group awards. So I was in better condition, and faster in short distances. But would it carry over into a race of 13.1 miles? I wasn’t so sure. Coach was, and she liked my strategy to start out around 7:50, settle in at 7:25 until mile 10, then give it whatever I had left for the final three. With thunderstorms forecast for Saturday morning, and temperature in the mid 50s, I brought several kinds of running gear and debated awhile before settling on shorts and two light top layers. 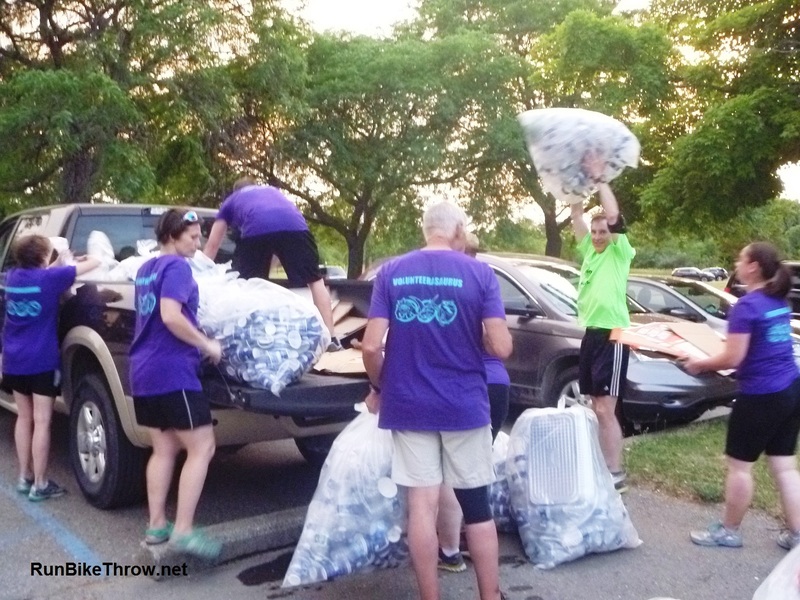 Remembering the discarded hats and gloves which had littered the road in last year’s race, I left those in the car and wore just a headband to keep the wind out of my ears and which could (and did) serve as a sweat rag in the later miles. 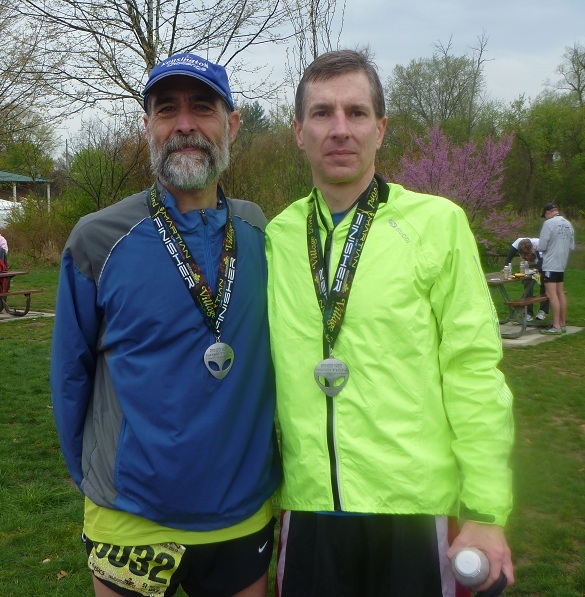 Me with Michael, one of the many other PR Fitness runners who rocked it out on Saturday. About ten minutes before the 8:45 start, I lined up near the front with some fellow PR Fitness runners who were conveniently also trying for 1:40 or better. I was happy to see them; even when wearing my Garmin I prefer to run with others, both for the company and as another check on my pace. I felt a sudden shortness of breath and heavy legs that I recognized as my standard pre-race jitters. You feel this way before every race, I reminded myself. Forget it and just run. The miles will take care of themselves. And so it proved. We ran together for the first few miles, starting at a 7:50 pace and increasing to 7:35. At mile 3 I kicked it up to 7:25 and settled in solo, only slowing a bit at the water stops so I could swallow the Gatorade instead of breathing it. Then two amazing things happened. 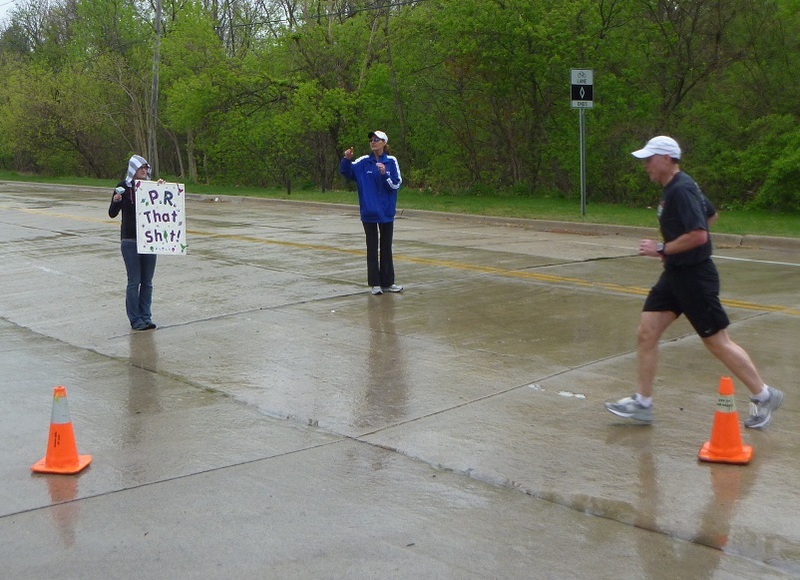 First, getting anxious around mile 8 because I would have to speed up soon, I tried a little mental trickery. I told myself that mile 10 was something to look forward to, because then I would get to run faster. And it worked! I stepped up my pace at mile 10 and again at mile 11 without a problem. To help me maintain the faster pace, I focused on staying with a strong runner in front of me, which worked great until I passed him. So I did the same thing with the next guy, and I passed him, too, and the next guy after that. This cannot be happening, I told myself. At mile 12 I gave it everything I had left, knowing there was a long downhill ahead and thus no need to save energy, and I passed more people. As I approached the finish line and saw “1:37” on the clock I knew I’d met my goal and set another PR. What a feeling for those last 50 yards! Motivation at the final turn. My finish time of 1:37:29 nearly cracked the top 100 and was good for 10th place in my age group, a huge improvement from 35th place in 2011. (For comparison purposes, I would have placed 13th in the 45-49 age group this year.) I had no illusions about winning an age group award in a large race of long distance, and yet if I can manage another improvement of 4 minutes next year, I will be right in there! Marie was right; I am a different runner, and perhaps the most important difference is that I believe it now. That’s the saddest lookin’ “winner” I ever saw. the guy i the green jacket. Or had younot raced yet? But you are wearing your martian medal !